Born at 1 St Aubyn Street Phelps was orphaned at the age of 16. Trying his fortunes in London he became an acclaimed tragedian actor, later founding in 1844 the Sadlers Wells Theatre, London. This photo was taken in July 2002; at that date the plaque was located as close as possible to the original St Aubyn Street, Phelps' birthplace - it was on the Chapel Street dockyard wall, the wall enclosing South Yard and which cut Fore Street in half. As a result of Devonport's regeneration programme Fore Street is no longer cut in half because the South Yard plot was returned to Devonport, the Chapel Street wall dismantled, and Fore Street made whole again. However, during that process the plaque disappeared. 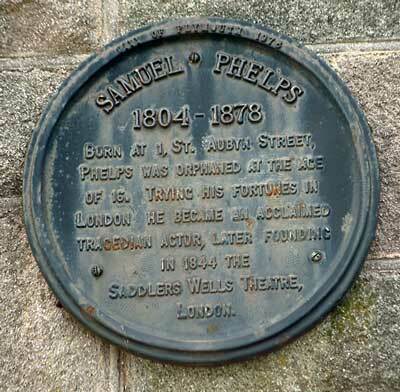 The Samuel Phelps plaque may be in the possession of the city council, for safekeeping, but this is unconfirmed. Around the time this photo was taken there was talk of the plaque being resited when and if the wall came down and South Yard was returned to the community. The situation wasn't definite at that point, as ideas and plans for Devonport were still in development, and news awaited on whether the Admiralty would actually return the South Yard plot. But it's now 2012; South Yard was indeed returned to the community, a few years back now - so whoever has our Samuel Phelps plaque, can we have it back please? We'd like to get it reinstated.